20 Day LSAT Countdown & Motivation! June LSAT takers, you are in the home stretch: 20 days until the June 2013 LSAT! And mark your calendars because after you relax with a guilty pleasure movie on the night of June 10th, weary from battle, you will wake up to a new day and a fresh start on June 11th! Just when you feel beat up and exhausted, I’m releasing the all-new, completely re-written, updated and expanded version of The Law School Admission Game: Play Like an Expert. The first version was published in 2009 and has been a bestselling law school guide ever since. But I’m throwing it away and starting over. You’re going to have access to my best, most detailed tips and suggestions in exactly 20 days! The new book includes tons of examples: law school personal statement introductions, addenda explanations of weaknesses in applications, resumes, and even a sample letter of rec. It walks you through everything from LSAT prep methods to choosing what schools to apply to, honest feedback on what law schools will think of your major, how to overcome weaknesses in your application, how to choose schools, and then all the way through the complications of waiting lists, scholarship negotiations and deciding where to attend. Don’t apply to law school without it! 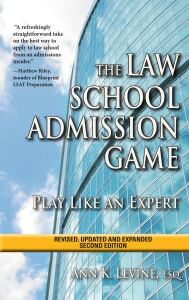 Then, mark your calendar to go to Amazon.com on June 11th for your copy of “The Law School Admission Game”! After all, you have 3 weeks before LSAT scores will be released. Use your time wisely and get ahead in the law school application process – be informed, be smart, and learn to play like a Law School Expert!